Skimmed Milk Powder (SMP) Plant is located at Varvand, Taluka-Daund, District Pune & its started in Dec 2014. This plant is installed in 5 acres with huge investment in infrastructure & advanced automation based machinery which milk handling capacity is 3.5 LLPD. It is high technology plant & can produce 30M.T. skimmed milk powder & 13M.T. butter per day, by producing 3.6 Lacs Litres of milk. Skimmed Milk Powder (SMP) is the product obtained by removal of water from milk by heat or other suitable means, to produce a solid containing 4 percent or less moisture. Butter is a product as a fat concentrate which is obtained by churning cream, gathering the fat in to compact mass and then working it. SMP Spray Drying Plant is most advanced evaporation & drying technology which is best in the world. This is a three stage drying technology with agglomeration & instantiazion. This plant having PLC-SCADA based fully automated system to enable the operation of the plant in a safe, efficient & reliable manner and ensuring the oerall plant performance. "Considering Mumbai's hectic life and the time spent in commuting", Mahanand Dairy has launched a revolutionary packaging for milk to provide convenience of milk storage, utilisation and consumption. Mahanand Dairy have inaugurated its first Ultra-High Temperature (UHT) milk processing and aseptic packaging plant in Goregaon, Mumbai on 15th Feb 2013 & it is inaugurated by Union Agriculture Minister, Honourable Sharadchandraji Pawar, the plant marks the entry of Mahanand Dairy into the UHT milk category with Mahanand Wholesome Nutritious Milk. The new product is catering to the growing demand for high-quality, safe and hygienic milk. Storage capacity of Aseptic Plant is 9.00 Lakh Liters. With support from Tetra Pak, the world’s leading food processing and packaging solutions provider, Mahanand Dairy’s UHT Milk & Kesar Elaichi Flavoured Milk are made available to consumers across Maharashtra in Tetra Fino 200ml, Tetra Fino 500ml, Tetra Brick 200ml, Tetra Brick 160ml & Tetra Brick 1000ml packages at a competitive price point. Milk packaged in Tetra Pak packages is Ultra-High Temperature (UHT) treated. In this process, milk is heated to very high temperatures for just a few seconds to remove all microorganisms. Milk so treated has no preservatives and does not need to be boiled, making it ready for consumption straight out of the package. Milk in Tetra Pak packages also has increased shelf-life and does not need to be refrigerated until opened. Tetra Pak packages are also 100% recyclable. Aseptic Plant has the capability, capacity and expertise to co-pack or contract manufacture dairy products. Also we have technology that will go to work for you, to ensure your branded products meet your specifications, and possess excellence in taste, appearance and performance. Our co-manufacture products include UHT milk & flavoured milk for various customers including Milk Mantra Dairy, Vaishno Devi Dairy & Dharampal Satyapal Group. 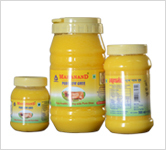 Mahanand had entered into contract "Manufacturing Agreements" for Production and packaging of these products. Ksheer Toned Milk & Double Toned Milk - Dharampal Satyapal Group. 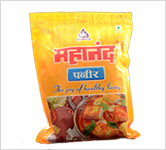 Ksheer Flavoured Milk (Rose / Kesar / Chocolate / Elaichi) - Dharampal Satyapal Group. MooShake (Nutty Badam , Peachy Strawberry, Slurpy Mango, Oh So Chocolatee and Vanilla O La LA. Flavoured Milk ) - Milk Mantra Dairy . Shubhi Skimmed Milk ,Toned & Double Tone Milk - Vaishno Devi Dairy. 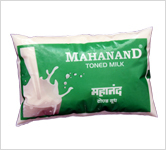 Mahanand Dairy is contineously engaged in supply of valued milk and milk and milk products to defense services. Mahanand Dairy had recently got order to serve 12.37 Lakh liters of UHT milk to Defense Services in Jammu & Kashmir area for the year of 2016-2017. Mahanand dairy is contineously supplying UHT milk to Indian Navy, Base Victualling Yard, Colaba, Mumbai from past 3 years. At MRSDMM, the work of prestigious "Solar Project" is going on with the assistance of MNES, New Delhi and I.I.T., Mumbai. The project work is at advance stage of completion and after completion of this project, milk pasteurize shall be run without using fuel (furnace oil, Diesel etc.) which shall be proved as boon to Dairy Industry. 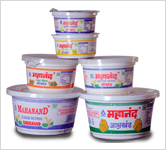 Mahanand Dairy is setting up totally automated product plant in Goregaon. It is going to launch within 3 month. The production capacity of Lassi is 5 MT/Day. The production capacity of Dahi is 5 MT/Day. The production capacity of Chaas is 5 MT/Day. The production capacity of Flavored Milk is 5 MT/Day. 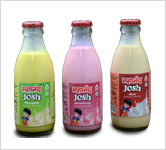 Mahanand has introduced Josh Flavour Milks (Rose,Strawberry,Banana,Lichi,Coffee & Kesar Elaichi) on Chatrapati Shivaji Terminal, Dadar, Kalyan, Mulund, Vikroli, Sion, Bhandup, Matunga, Chinchpokali, Cotton Green, Byculla, Badlapur, Curry road, Kasara, Karjat, Tilaknagar, Ghatkopar, Pune, Shivaji Nagar, Lonavala, Talegaon, Nashik, Chalisgaon, Ahamadnagar, Miraj, Karad, Malkapur, Daund & Bhusaval Railway Platforms from 10th January 2006. 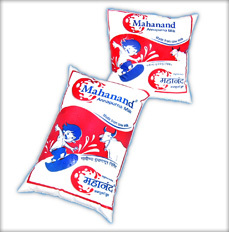 Modernization of Mahanand dairy is future plan. Customized ERP has been implemented across the organization integrating various operational department. Milk Collection System is installed at milk collection centre. It captures the milk fat & snf content, toatl volume of milk Training is being given to staff.